So while I was calling it Zero kara in the early days, before the first episode aired, I don’t think that particular handle suits it; the other White Fox fantasy had the same two words. I guess I could get used to the English title, as it is fairly apt – we could wing it with GoZ. But I could get used to the title abbreviation of Zeronosyo; what do you think? I like a world that builds itself with some bold swathes, at first, then takes the time to explore the niches & alcoves, and the nook & crannies inside all that bold. It’s also a sign of a pretty good storyteller when they engage in relatable feelings or instances for the introduction, instead of just diving deep into the weird esoterica right off the bat. This one did both the broad and the relatable right from the get go, in both it’s narration and overall structure, and in the development of the primary characters. Using outcasts in fantasy fiction has a great and storied tradition, as it’s just the thing you need to begin with and develop all the lovely contrasts you need to tell a richer story. Not in blood, but in friendship! But after all is said and done, this is a good character study. Both Zero and Mercenary are the microcosm to the plot’s macrocosm. Now, I’ve seen a few examples of the overall structure the show is going with; Spice & Wolf to name just one. But while I did enjoy that show, this one and that one borrow from history; in all it’s tragic but true shades. I won’t go for to deep a dive at this point, but the underlying reasons for why we get inquisitions are as human as fear, jealousy, mistrust, and greed. I’ll explore more of that when I hit the second episode. In getting back to the micro, Zero is an instantly likable character, as she has charm and cuteness on her side. But honestly, it’s her off the cuff sense of humor and the way she challenges the world. That’s what has me captivated. She’s on a mission, she has a skill set, and while there is a larger world for her to explore, and maybe even save, let’s take the time to enjoy what she is right now. Who’s my fuzzy wuzzy friend!? In that I love how we have two characters that should be at odds, given the background. Mercenary was born a beastfallen, and while the general population has uses for him when he’s hunting witches or when he’s on the battlefield, he’s deemed to strange and frightening to be in the public eye, barring a few outliers; the village in the second episode was all too happy to see him for his witch-hunting skills; more than his company that’s for sure. For her part Zero is all to aware of the recent troubles surrounding her sisterhood of witches. But we start her off when she is ready to come out of hiding due to great need. When the two meet, it’s an awkward affair. He hunts her kind, her kind are just horrible people, and probably to blame for his current predicament. But they find a great deal in common with each other. At first it’s just that they both are hiding and on the run. But over a very short period of time, they both see each other as human as everyone else. I know Zero says she see the human face beneath Mercenary’s cathead, but I think she’s speaking poetically. That Mercenary seems to think that she can “cure” him of being a beastfallen is just a very interesting plot point, one that I’m sure they’ll explore later in the story. Goodness, I’m happy they didn’t play the “my parents think I’m a monster” point. It’s enough that other people don’t like him for horrible reasons, anything else is an unnecessary twist of the knife. But they do rather warm up to each other quickly. I’ve seen some complaints about that quickness, but don’t underestimate the human need for companionship and warmth. That’s what’s underneath, what makes it work on top is probably more utilitarian, as two is better than one if all the world is against you. Also the temptation to serve this higher purpose that Zero is search for really resonates with Mercenary on many levels. This brings us to the magic of Zero and her world. I have to admit, that I am a bit perplexed at how it is presented. Now, I do acknowledge it’s story reason. Sorcery is one thing, magic is a different thing, that will become important as the piece moves on. It’s onscreen presentation and explanation is somewhat lacking to me, however. But for right now, it has just enough touch to give it purchase. Since I’m being honest, I will insist on more of a punch for the two systems as it become more important to further divide the two sides, but bring them back in alignment later on…yes, I’m calling the endgame now. But by my gathering, sorcery uses the system of the world around it (including otherworldly beings!) to give it structure. The basic laws of physics can’t be beaten! But magic is rewriting that system to achieve, I guess, more advanced or more impossible results. I do get that, but as presented, the space between the two feels narrower than it should given the weight Zero gives that space between. Now, having said that, I do rather like the introduction of Albus. He was a greater chaser at the beginning, giving Zero one of her best one-liners. But at the end, he revealed both himself and that Zero’s plans have plans of their own. The Magic of Zero has taken root in ways she didn’t realize. Oh, why did it have to be a book quest?! LOL! As they move into the second episode, that moral grittiness I Mentioned earlier rears it’s head. The Malleus Maleficarum style plot point the show is sowing has grown roots in this culture, and the tree bears a great deal of confusion and pain born from snap judgement as it’s fruit; ironic in that a tomato was part of the whole deal turning sour. If I do have a complaint about the village part of the program, it’s that it was a bit too much on the nose. The aggro was a bit to fast approaching the slippery slope. I understand that a show deals in broad strokes and all, but darn that escalated quickly! In all it felt rather forced. But negative escalation like this is actually true to life if the mistrust is boiling underneath the surface. I think the villages were probably doing the best they could given the situation they found themselves in. Fear to the left, fear to the right. It actually reminds me of a bit of Pterry wisdom about the medieval viewpoint of the end of the world; something that Junketsu no Maria explored. If your village ends up being destroyed, that’s the end of the world for you more often than not; that’s a person’s only real and visible support in a harsh world. But to modern eyes, they were sure agents of paranoia, and didn’t come off in the right light at all, which is part of the design. I think we’ll have to put a bookmark on this situation, as they’ll really have to put some witches in a bad light as well, to balance it out? So, is Albus a girl in disguise? So all of this ends up with a chase; as standard a one goes in chases. But it’s just ground they cover to find the common one. Zero hits it right on the nose, skewing both viewpoints in how they look for the complete justification of murder; both sides do have blood on their hands. Both sides do abuse power in their own way. Other rings can be made or found, more tomatoes can be grown and picked. But it’s never about those little things. Once Albus issued the challenge over how they treated Sorena it was like he lite the powder keg, in a way. But for all the chase, it’s the witches that come out stronger. Both Sorena and the elder villager that helped them find safety did what was needed, a sacrifice. Sometimes it become inevitable. For Sorena the price was her life, for the elder it’s realizing she spoke to late. All in all it was a pretty bad situation to learn from, which is part of what the show is trying to say. The LN artist’s work is something else, isn’t it? This was my second most anticipated show this season, and I’m glad I got a chance to cover it. I’ll keep this bit short, as I think I’ve said plenty in around 1600 words. If they keep this show personal, if they can keep it on the level of both Zero and Mercenary, then I think we will have a great winner on our hands. One of the reasons I love fantasy so much is that the sometimes magical, weird, esoteric, and odd stuff they bring to the fore is just that it’s cool window dressing on one part, and a way to read the subtext on another layer. This is a violent world, and it evokes a great deal of our regrettable past. By framing it in a magical light, it allows us the safety bubble to explore why those things really were regrettable, and more important, repeatable. I’ve enjoyed the very personal story it has to tell. This is because I love the two people in it…here’s hoping they can bring us something very magical. If I do have a complaint about the village part of the program, it’s that it was a bit too much on the nose. Readers say the whole village part is anime-original. Vol 1 mentions it as the place where Solena was executed, but it never appears proper in the book. 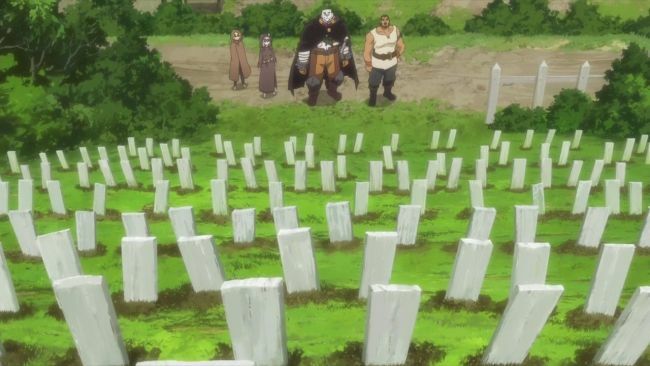 Some think the anime’s padding itself with extra visual worldbuilding (over infodumping) to ensure Vol 1’s plot can be covered in Zero’s allotted 12 episodes – apparently Vol 1 is its own full story arc which covers the mystery of the missing grimoire. Vols 2-3 are another 2-part story arc, which may not be able to be squeezed together with Vol 1’s. Plus I love how she says, “soup”. Zero’s LN illustrator, Yoshinori Shizuma, is also famous for designing Kantai Collection characters like Shimakaze and Nagato. Ok, so worldbuilding on an emotional level over dry infodump. The execution was a bit wobbly, but I’ll take it. Oh my, Zero’s resemblance to Shimakaze is there isn’t it? The Witch and the Beastfallen. Sounds pretty close to a recent Disney “tale as old as time”, doesn’t it? A beast who wants to become human, a bookish girl wanting to see the world. I’d be amazed if the Japanese don’t end up making the connection though, considering how famous Disney franchises can be over there. See, I was trying to avoid the connection…but this is fair. Or it could be a coincidence, the novels only started back in 2014. I think it’s also the timing of the anime’s release while the new BtB movie is still fresh in people’s minds, so those who’ve seen/heard of it might realize the parallels. For Japan, they get BtB this April 21st. So the parallels will be even fresher for Zero viewers who watch the movie there. I wonder if they have a dub cast? I just tried to look it up but didn’t really find anything. I think I saw that Maaya Sakamoto was the lead in Sing, but that’s animation from another studio. They’ve got a J-dub cast, it’s listed on Japanese Wikipedia. They have Kon Natsumi (Isshukan Friends’ OP singer) dubbing Emma Watson’s Belle, and musical actor Yamazaki Ikusaburo as the Beast. Not many current anime VAs for this one – most VAs here are in the musical theatre scene. Yeah, it’s appropriate they came from the right background, but it’s fun seeing some potential cross-pollination. Natsumi sounds like she has the range for Belle. I’ve only heard the soundtrack for the live action, and it didn’t really impress. But then I’m just a casual fan. Zero is such a smug anime girl that its awesome! Shes a lot of fun to watch and oh boy another witch burning series! I know that theme comes with the territory so its always going to pop up! I think it’s mentioned a few times in LWA at some point. But is Zero as Smug as a Duck? That about sums up my feelings throughout both episodes and they’re not faint. I really can’t help but dislike humans when it comes to stuff like this. Regardless of their reasons, they, by nature, just systematically alienate anything that’s unlike them. This is why the “Humans Are the Real Monsters” theme exists. The sad, hurtful part is how the idiotic conflict began in the first place. A coincidence shows up and the mindless mob jumps to a dangerous conclusion. If at least a handful of them had stopped and used their heads, the bloodshed from either would’ve never happened. The good part in this so far is that our Beastfallen mercenary protagonist is seeing things for himself and steadily abandoning the witch-hunting bandwagon. Zero bounces off him nicely and watching engage in conversation is becoming something to look forward to. At first, I didn’t like the idea of a third wheel but after the second episode, I’m willing to give Albus a second opinion. While it’ll be trouble containing my intense contempt for the humans, I’ll be following this series to the end. Well the mob was painted in very broad brushes, so we were supposed to see exactly how monstrous they could become. So job well done on the writer’s part. Zero and Mercenary are so wonderful together, they didn’t even know they would fit each other’s thoughts until they met. It’s not exactly romance, but it is endearing. I’ve not really made my mind up about Albus. He seems like you point out, a third wheel, someone to take the show in a direction two reasonable people would not go, but might think internally.